If you are using simple T-SQL UDFs that do not touch any tables (i.e. do not access data), make sure you specify the SCHEMABINDING option during creation of the UDFs. This will make the UDFs schema-bound and ensure that the query optimizer does not generate any unnecessary spool operators for query plans involving these UDFs. Are there any other advantages of SCHEMABINDING a function, even if it does not access data? Failing to specify WITH SCHEMABINDING means SQL Server skips the detailed checks it normally makes on the function body. It simply marks the function as accessing data (as mentioned in the link given in the question). This is a performance optimization. If it did not make this assumption, SQL Server would have to perform the detailed checks on every function invocation (since the unbound function could change at any time). The two data access properties have been set true, and the other three are set false. This has implications beyond those that might be expected (use in indexed views or indexed computed columns, for example). The Determinism property in particular affects the query optimizer. It has detailed rules concerning the types of rewrites and manipulations it is allowed to perform, and these are very much restricted for non-deterministic elements. The side-effects can be quite subtle. The fundamental issue is that the query optimizer cannot reorder nondeterministic query elements as freely. To produce a seek, the Filter predicate would need to be moved down the plan to the T2 data access. This movement is prevented when the function is non-deterministic. The first step is trivial. The second involves removing the non-deterministic implicit cast from string to datetime; replacing it with a deterministic CONVERT. Neither is sufficient on its own. With the optimizer freed up, all examples now produce the desired seek plan. Not the answer you're looking for? Browse other questions tagged sql-server functions or ask your own question. 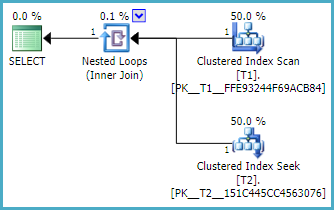 Why do SQL Server row estimates change when I add a join hint? What kind of object is being checked against the cache when a new query arrives? WHERE vs. HAVING on non-aggregate columns. Advantages / Disadvantages / Irrelevant?